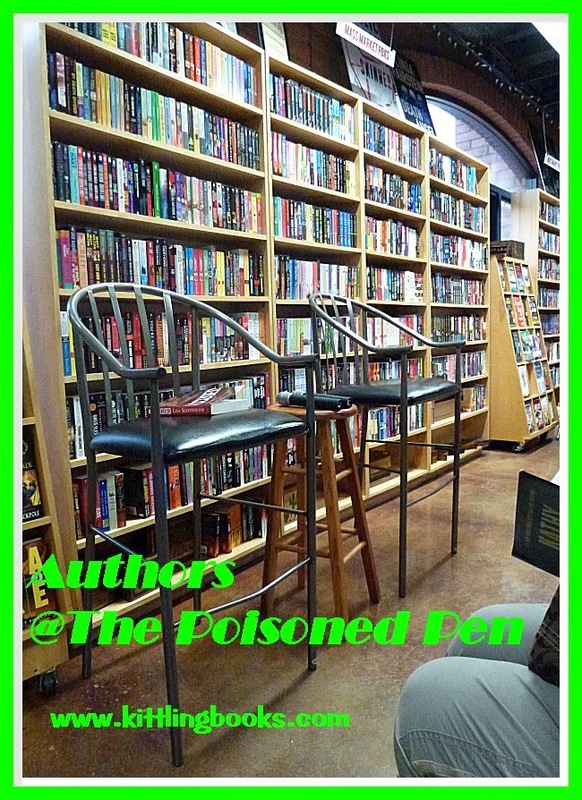 @ The Poisoned Pen with Ben H. Winters! If you've been paying any attention at all to my blog, you know that I've loved Ben H. Winters' Last Policeman trilogy from the very first book-- so much so that Denis is now in the process of reading the first one-- The Last Policeman. It's no wonder that the two of us jumped in the Jeep and headed for our favorite bookstore, The Poisoned Pen, for a chance to meet the author. Who is that cute kid with the messenger bag? The two immediately mentioned the Last Policeman trilogy and its timing. The first book, The Last Policeman starts off the tale of a young detective who's working hard to solve a mystery when no one else cares. You see, a huge asteroid will be slamming into Earth in ten months, and people are acting more than a bit squirrely. (Some of the enjoyment in reading this book is in finding out all the ways people are acting strangely.) 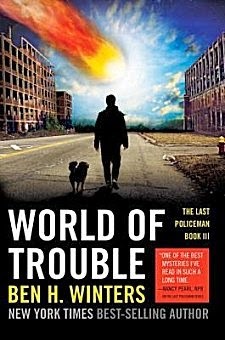 The second, Countdown City, takes place with 77 days before the asteroid hits, and the third, the just released World of Trouble, begins with only three weeks left before the end of the world. To understand Winters' trilogy, we needed to know about his relationship with his publisher, Quirk Books. Quirk Books is a small publisher that looks for "something with a big hook." Their first big success was a book called Pride and Prejudice and Zombies, and when they asked Ben if he wanted to write Sense and Sensibility and Sea Monsters, he jumped at the chance for his entrée into publishing. As he was working on Sea Monsters, he was already planning his next book. He wanted to find a way to contemplate mortality and other big topics within the framework of a detective story. The birth of The Last Policeman followed. Although Winters read and enjoyed post-apocalyptic classics like Cormac McCarthy's The Road and Nevil Shute's On the Beach, he didn't want his books to have that sort of time frame. He wanted a pre-apocalyptic vision of the world in which he could explore all the different ways people would react to the news of the asteroid and the end of the world. For example, the first book in the trilogy shows people splintering, moving away from everyone else in an "every man for himself" sort of mentality. The second emphasizes people who have sought a communal approach to the coming calamity, and the third shows how one particular group of Amish-- people who have traditionally always shunned modern technology-- have reacted. "As I was reading, I found that there seems to be a psychological need for people to find somebody to blame," Patrick commented. "The behavior of some of the people in your books also reminded me of Anthony Burgess, who wrote A Clockwork Orange. He was diagnosed with a inoperable brain tumor. Fortunately the diagnosis was incorrect, and he lived to write over thirty books and many other things. But his behavior certainly changed over a certain period of time!" "It's not got enough of the end of the world!" 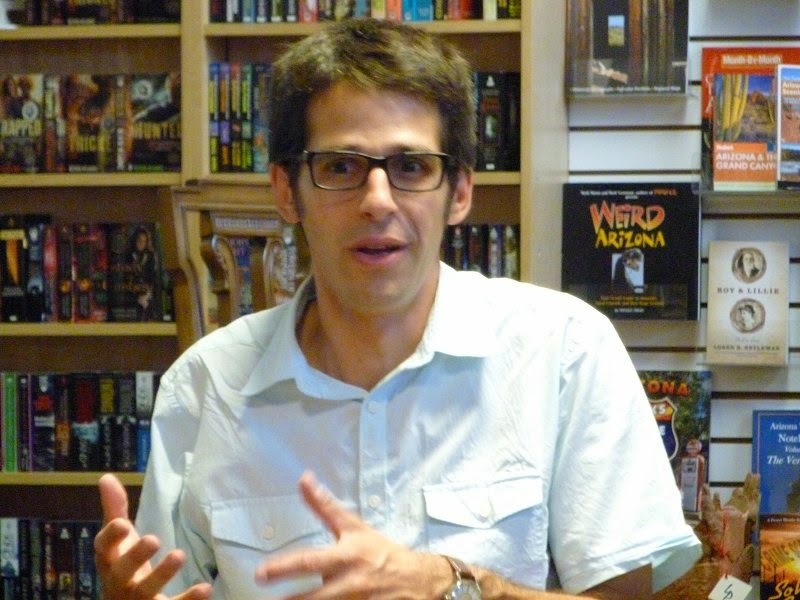 Winters described his main character, Hank Palace, as "the quintessential nerd-- very focused, very diligent, with an almost physical need to do his job." After admitting that he's been keeping track of reviews at places like Amazon, Ben mentioned reviewers who were complaining because World of Trouble didn't have enough of the end of the world to suit them. Laughing and shaking his head, he said, "That was never the focus of the books-- to have everything blow up at the end. The asteroid is an obstacle to be overcome, and I wanted to show how Hank and others tried to get beyond it." Going on to speak more about his main character, Ben said, "A promise is a promise. Hank Palace believes that if we all did what we should be doing-- what we said we would do-- everything would be fine until the asteroid hit." If we were wondering just how attached Winters was to his creation, he let us know with his next words: "Hank Palace is the cop who cares when no one else does, but that doesn't mean that I always believe he's doing the right thing-- especially when he insists on pulling someone away from his/her equally important priorities to help him with something." "Hank's sister Nico is the polar opposite of her brother in a thousand different ways," Ben said in a little preview of World of Trouble. "She gets involved with a shadow organization that works to prevent the end of the world, and then she disappears." 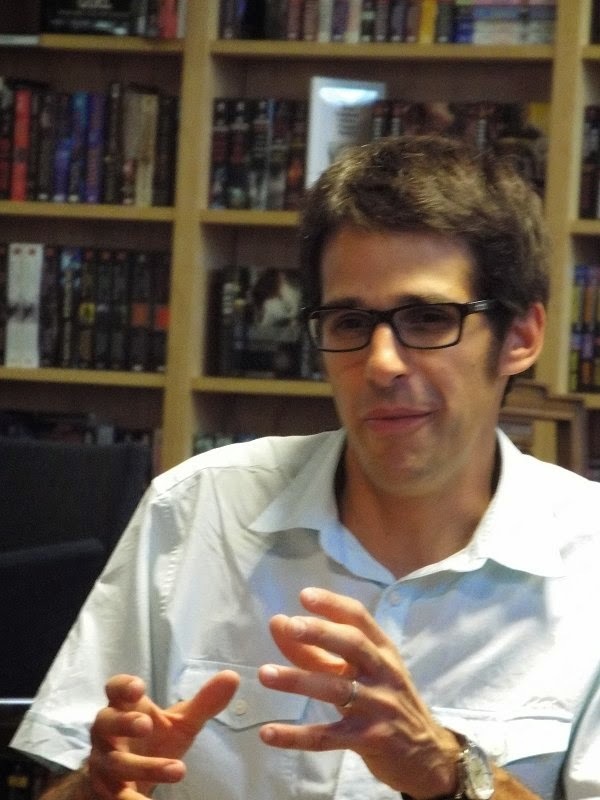 Ben Winters' lanky frame with its computer posture exudes enthusiasm for his writing and for books in general. I like the fact that he has strong opinions and isn't afraid to voice them, even though he may offend some of the thinner-skinned. Since we couldn't talk in depth about the books because of the very real possibility of spoilers, talk began to move to the author's writing and research. "I know! I'll write a detective story and put an asteroid in it! Well, what I didn't realize is that the asteroid makes my books science fiction whether I wanted them to be or not. It has given me a crossover audience though, which is a good thing." Ben continued, "I really enjoy musicals, and I learned very quickly that every musical has a big 'I Want' song. Annie wants parents...."
"'If I Only Had a Brain' for The Wizard of Oz?" Patrick offered, to laughter from us all. "Exactly!" Winters exclaimed. "World of Trouble has its own 'I Want' song-- or mission statement-- and it's on page 34 whenever you get a chance to read it." (He did read it aloud to us, but I decided not to type it all out for you.) However, he did conclude with "This time, it's personal." I would imagine that most authors really do not appreciate the time they have to spend selling their books on blogs and social media platforms, and Winters is no exception. He told us that he'd been writing so many guest posts for blogs lately that he'd lost count. "I really don't want to remember," he admitted. "Even the word 'blog' still makes me slightly nauseous." Prime opportunity for me to get offended, wasn't it? I didn't bother wasting my time, especially since I've always hated the word 'blog.' It sounds like someone is in the process of throwing up. Bleurgh. Ben went on to tell us that there are currently ten foreign language deals in the works for his books. He's thrilled. "These types of deals make me feel like a real author." Someone asked Winters how much research he'd done. "I talked with several astrophysicists, economists... people like that," he said. "One of the people I talked with most was Dr. Timothy Spahr. I wanted an asteroid big enough to destroy the planet, yet have it be something that we wouldn't have seen coming from a long way off. I asked him if that were possible. Dr. Spahr looked at me and smiled. 'I'll get you your asteroid,' Spahr told me." Winters continued to field questions from us. His books are officially under option to a company that's pitching them to various cable television outlets. "I'm not going to waste my time wondering and asking what's going on with it. Not when I'm busy working on the next thing," he said. "What is the next thing?" I asked. Winters looked as though he wished no one had asked, but he'd opened that door, and I just had to walk through. "I'm working on a sort of alternative history slash crime novel set in Indianapolis where I currently live. It involves race relations and is centered on an African American vice cop," Ben said. "I can't tell you how much fun it is not to write as Hank Palace. I'm having a lot of fun!" Another person asked him about his reading, and Winters recommended Clockers by Richard Price. "It's one of my favorite books. I also like Gillian Flynn, Lauren Beukes, and Patricia Highsmith. Personally I have issues with Highsmith [she was a bigot]... but-- her books!!!" He put in a good word for Tim Johnston's book Descent which is coming out next year, and he also recommended John LeCarré's Tinker Tailor Soldier Spy. Patrick Milliken added, "Didn't he coin the term 'mole'?" Winters nodded enthusiastically. "Yes! The people at the Oxford English Dictionary contacted him about it!" Another fan asked him if he'd always known how his trilogy was going to end, or if he'd figured it out as he wrote. "I always knew how I wanted to end it-- right from the beginning." Although he admitted that it would be possible to write a follow-up, he's not interested. "There are so many excellent post-apocalyptic novels available that I certainly don't need to attempt to add to the list." The last thing we talked about that evening was eBooks and how Winters felt about them. Although he doesn't have anything against eBooks as a medium ("If they get more people to read more books...."), he is worried about them for another reason. "There's tons of stuff being published with 99¢ or $1.99 price points, and I'm afraid that book buyers are rapidly getting unrealistic expectations of book prices. 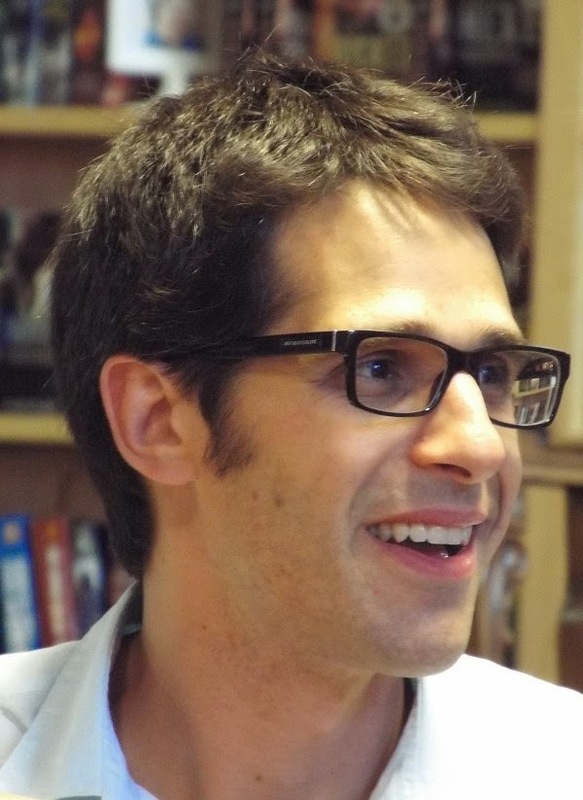 And as more people turn to eBooks, booksellers are having a harder and harder time making a go of it," Ben said. "Publishers are giving booksellers a lot less attention. It's becoming difficult for authors to go on tours to promote their books. I would hate it if touring stopped completely because I love getting out among people and talking about my books-- well, about books in general to be honest!" 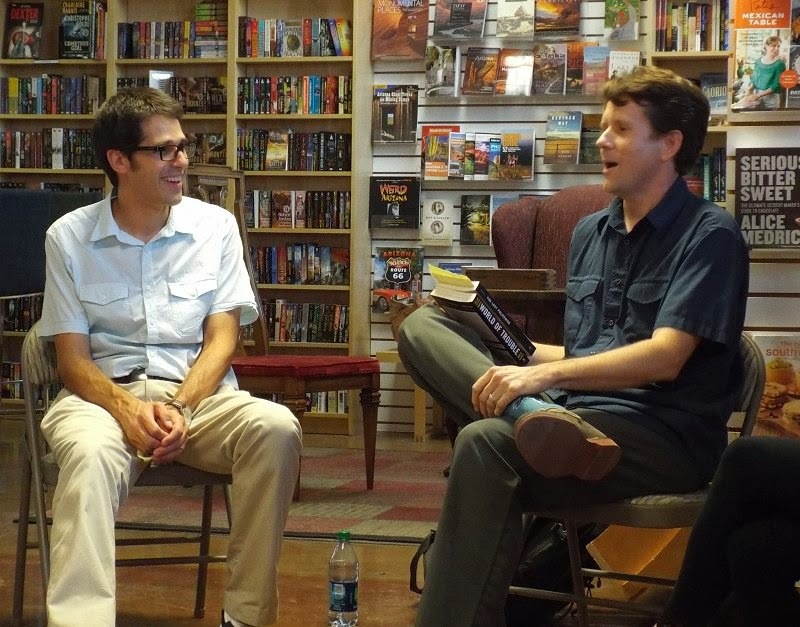 Ben Winters' smile and his enthusiasm for writing and for books is contagious, and I'm so glad Denis and I went to The Poisoned Pen to meet him-- even if I did think he was a cute kid with a messenger bag at first! I was thinking he looked awfully young too! Sounds like a fun event! Cathy - Another great evening! Lucky you! Maybe it's because I'm - ahem - not twenty any more, but yes, Winters does look young. Sounds like an evening of fun, although I don't know that anything/anyone could drag me out of my house at 113-degree temperatures. I don't think I've even experienced that during my Chicago childhood. I think 103 degrees was the worst it got. Time for a/c, good books and iced tea. I'm not into apocalyptic books, but I surely enjoyed reading about this energetic, smart young author. He has a lot to say about many things, so I'll keep reading about him. I've always had a bit of a thing about apocalyptic novels. As strange as it may sound, I enjoy reading the authors' opinions of what would happen, how it would happen, why it would happen... and how people would react to it all. I'm in love with the trilogy and with its main character. I also really enjoyedBedBugs, which came out after PP&Z, and before The Last Policeman. I think I have BedBugs around here somewhere. It's probably given up hope of my ever reading it.